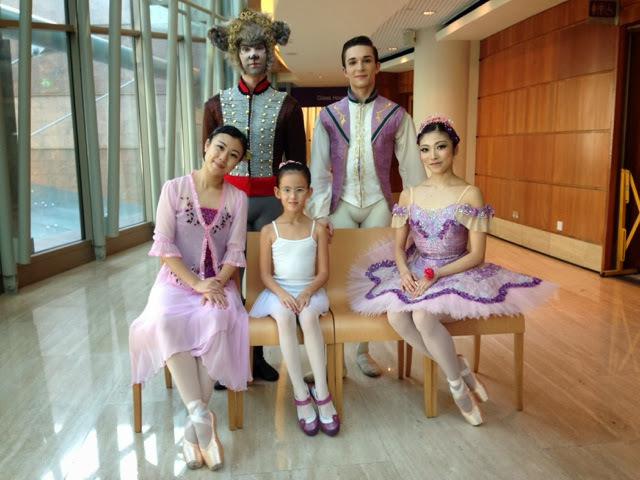 Today, I took my aspiring prima ballerina to the Esplanade for the Dance Appreciation Series where the Singapore Dance Theatre (SDT) had a one hour session about The Nutcracker, the show they will be performing this coming December. Last year we went for the same dance appreciation series on Sleeping Beauty and the girl thoroughly enjoyed herself. These short sessions allowed even the littlest ones to sit through a ballet performance without too much protest. It also gives them and possibly us adults, a better understanding of some of the pantomime gesture, some background to the story and some other details about the performance, e.g the music, the costumes. At today's session, we saw kids as young as 18-24 months in attendance. The fun part for kids is that at the end of the hour preview of The Nutcracker, the audience was allowed to have photos taken with some of the dancers. This was one of the highlights for the girl. By coincidence, she wore matching colours with the dancers, white and purple (as per the sugar plum fairy character). At the end of it, we went to the box office at the Esplanade and bought tickets for the full length dance on 6 December! There are still very good seats left and if your child (age above 7 years old) is interested in ballet, I totally recommend going for it. There's a 1pm show on the weekends too if 8pm is too late. Check it out here.